Liverpool career stats for Sami Hyypia - LFChistory - Stats galore for Liverpool FC! Sami Hyypia's performances reminded fans of the good old days of legendary giant Ron Yeats, who was Shankly's pillar in defence. Hyypia was Houllier's tower and later Rafa's. Hyypia was strong, composed and led by example. The word “legend” is often over-used and mis-used when it comes to sporting achievement. There can, however, be no doubt that the word can justifiably be used to describe the fantastic service Sami Tuomas Hyypia gave to Liverpool Football Club. 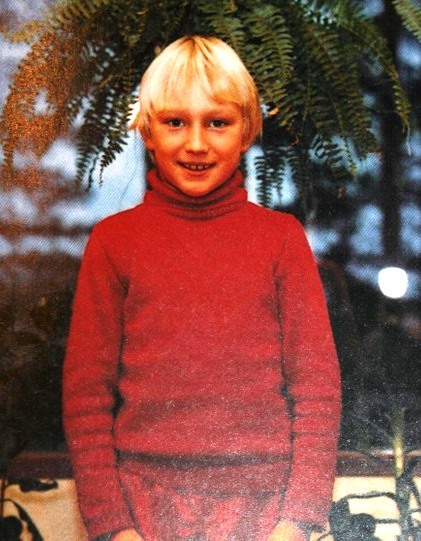 Hyypia signed for his local club Kumu, then in the Finnish second division, at the age of 17, after having spent ten years at Voikkaan Pallo-Peikot for whom he had made three appearances in the third division in 1989. He made a decision to undertake his period of National Service sooner rather than later because it might become a problem if he would be playing in another country. On his return to football after eleven months in the Army, Hyypia impressed the watching MyPa-47 manager and this led to a transfer to a bigger club in Finland’s first division. Hyypia spent four seasons with MyPa, during which they finished league runners-up three times and won the Finnish cup twice with Hyypia’s header being the only goal of the 1995 final in his last match for the club. That victory put MyPa into the 1996/97 Cup Winners’ Cup, where they would be drawn against Liverpool; but then Hyypia had already moved to Holland. He might have been plying his trade in England even earlier because Hyypia was twice invited to train with Newcastle for a few days, something he also did in Turkey and Germany with Samsunspor and Werder Bremen respectively. Scotsman Jimmy Calderwood signed Hyypia for the Tilburg club Willem II but not long afterwards Calderwood was replaced by Dutchman Co Adriaanse, whose nickname was “Psycho Co” because of his alternative ideas about fitness and training. Despite Adriaanse’s gruelling regime Hyypia believes that the whole Tilburg experience was positive because when he adjusted to Melwood “it was like going back to normal”. Dutch clubs struggled to cope with the extreme fitness of the Willem II players and Adriaanse was able to give Tilburg European football for the first time after finishing fifth in the Dutch League at the end of the 1997/98 season. Although Real Betis ended their European hopes, an even stronger season in the League saw Willem II finish runners-up and gain automatic qualification for the group stage of the following season’s Champions’ League. Liverpool have a TV cameraman to thank that Hyypia came to Liverpool. Former Chief Executive at Liverpool, Peter Robinson, tells the story: "It was mid-way through the 1998/99 season when there was a knock on the door of my office at Anfield," Robinson said. "I had never met the chap. He came in and introduced himself as a cameraman who covered football in Europe. He knew we were looking for a strong defender and recommended we take a look at Sami, who was playing for Willem, one of the smaller Dutch clubs. That is how it all started. I passed the message on to Gérard and, over the next few months, members of the staff went to Holland to watch him on several occasions." Ron Yeats was Liverpool chief scout at the time and when asked by LFChistory.net which Liverpool signing he had been most happy with only one came to mind. "I was glad we signed big Sami Hyypia. I went to see him after we was recommended. I thought this boy looks a good player. At centre-half he was a great passer of the ball which is unusual for centre-halves. I was really taken with Sami and I put in a report that either the boss or a coach should go over and see this man. They did and then signed him a few weeks after the recommendation." Yeats could easily identify with Hyypia. "They say he hasn’t got any pace. I didn’t have great pace but I could read what players were going to do. You put them in a corner more or less. The only thing you have to do is get past me on the left and I have got you there. You wonder: ‘how did he manage to get that?’ Well, this was the only place the player could put it and used I to be the same myself." Liverpool didn’t waste any time. Houllier preferred if possible to have potential summer signings agreed and signed up before the end of the previous campaign. So Sami travelled to Liverpool and signed a contract on 19 May 1999 with the fee being £2.5 million, an incredible bargain in view of what was to come over the next ten years. Ron Yeats later admitted: "When I was told how little money Liverpool had spent on Sami, I nearly fell off my chair!" The flamboyant football played under Roy Evans meant that although plenty of goals were scored, far too many were conceded. It was clear that especially in defence, there needed to be changes. 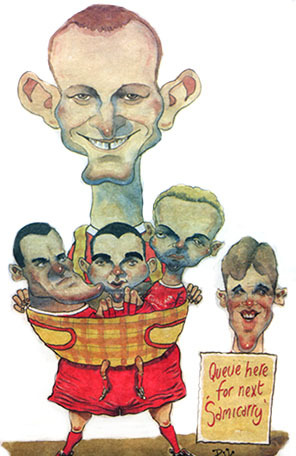 Hyypia was part of that change under the Houllier/Thompson management team, as was the man who would become his reliable partner in defence, Stephane Henchoz. Even at the early stage of his Liverpool career, it was clear that Liverpool had signed a player of great stature and ability who was a leader on the pitch. Even in his first season at Anfield, he was asked to deputise as captain for the injured duo of Robbie Fowler and Jamie Redknapp; and when both those players moved on in 2001 and 2002, Houllier had no hesitation in handing the Finn the captain’s armband permanently. He had already worn it proudly for most of the historic 2000/01 campaign, being modest and humble enough to ‘share’ the cup presentations with Redknapp in Cardiff and Fowler in Dortmund. Hyypia's game was so immaculate he did not receive a booking for 87 matches in a row from January 2000 to October 2001. However, this consistent performer was not his usual self in 2002 and 2003 and in October 2003 Houllier made Gerrard captain instead of the mighty Finn. Hyypia accepted the decision with typical dignity and was soon back to his best. Hyypia’s main responsibilities were of course in defence, but he still often found time to be effective at the other end of the field, with his contribution to Liverpool’s cause in goals scored being very commendable in comparison to some of the club’s illustrious predecessors in the same position. Hyypia netted 35 times in his ten years at Anfield, compared to Hansen (14), Lawrenson (18), Thompson (13) and Yeats (16). Hyypia never scored more than five goals in a season, but he scored at least twice in each of his ten seasons as a Liverpool professional, the first coming at home to Manchester United in September 1999 and the last coming in the 5-1 drubbing of Newcastle in front of their own supporters three days after Christmas 2008. In between were numerous strikes of varying importance, but probably none more important than the three goals he scored in Champions’ League quarter-finals in 2002 against Leverkusen, 2005 against Juventus and 2008 against Arsenal. He rates the sweet left-footed strike against Juventus as his best goal. It was crucial in eventually ensuring a narrow aggregate victory as Liverpool moved on towards Istanbul. Hyypia was a key player in Liverpool's European triumph in Istanbul in 2005 as he had been the previous seasons emphasised by the fact that Hyypia played every minute in 57 consecutive European games for Liverpool from 20 November 2001 to 21 February 2006. Hyypia formed a superb partnership with Henchoz when they both arrived in the 1999/00 season, bettered only by the Hyypia and Carragher combination under Benítez. It is testament to his ability that through two different Anfield regimes, Hyypia remained as solid and dependable as ever, and having won every other trophy, only needed a Premier League winner's medal to complete his set. Daniel Agger's emergence in the 2006/07 season forced Hyypia out of the first eleven, but when called upon, was still a class act. Hyypia was linked with other clubs during the summer of 2007 but nothing came of it. He started his ninth season at Liverpool less sure of his place in the team than at any other time since his arrival in 1999. This was partly due to his advancing age but also because of strong competition for places. Agger's long-term injury gave Hyypia a more prominent role in the team and he didn't disappoint. Martin Skrtel was the only other serious competitor for Hyypia's place in the team but he didn't arrive until January 2008 and so it was Hyypia who added another 44 appearances to his already-impressive total. In April 2008 Hyypia signed an extension to his Liverpool contract that would keep him at the club until the summer of 2009. Hyypia only played 19 times for the first team in his tenth and final season. Eventually Liverpool fans and the great Finn had to part ways. Hyypia had been sitting firmly on the bench in the previous four League matches, but there was huge expectation that he would play some part in his final match at Anfield against Tottenham on 24 May 2009. A number of fans were disappointed not to see him lead out the team and Benítez kept everybody waiting until the eighty-fourth minute despite frequent chants of 'Sami, Sami, Sami, on, on, on!' all around the stadium. Steven Gerrard was substituted who in turn took off the captain’s armband and handed it to Hyypia symbolically who proudly wore it for the final time as the match reached its conclusion. Hyypia became extremely emotional when the referee blew the final whistle and the ovation he received from all parts of Anfield reflected not just what a terrific servant Hyypia had been for Liverpool, but also what a genuinely nice guy he is. After he left Liverpool went on a downward spiral and the inferior performance of the club's defenders can be attributed to Hyypia's absence. He had been vital on the field as well as off it as Fernando Torres pointed out. "Sami may not have played every week but he was a 10 out of 10 on and off the pitch, bringing calm to the ground and having everyone's admiration." Liverpool wanted to keep him on the coaching staff but Hyypia felt that he could play regularly for a couple of years more which he promptly did with Bayer Leverkusen. Roy Hodgson even tried to bring Hyypia back in 2010 but couldn't get him released from his contract. The reason for Hodgson's eagerness to bring Hyypia back was simple. "He's one I would also put in the Jamie Carragher and Steven Gerrard mould, Liverpool for life." Hyypia was Finland's captain when he played his one hundredth game for the Finnish national side on 12 August 2009 against Sweden. He made five more appearances before retiring from the international scene after a 2-1 loss to Hungary in a Euro 2012 qualifying match on 12 October 2010. On 1 May 2011 Hyypia announced at a press conference in Finland that he would be retiring as a player at the end of the current season. He would, however, remain at Leverkusen as the club's assistant manager and would also join the coaching staff of the Finnish national team. In April 2012 Hyypia was named as caretaker-coach at Leverkusen following the dismissal of Robin Dutt. Sami was to work alongside the club's Under-19 coach, the German Sascha Lewandowski. A month later the club announced that both men had signed permanent contracts that would last until 2015. Hyypia led Bayer Leverkusen to third place in the Bundesliga in 2012/13 ... behind Bayern Munich and Borussia Dortmund ... and that was good enough to take them straight into the group stage of the Champions League for 2013/14. On 4 April 2014 Leverkusen dismissed Hyypia, after one win from the past nine league games. A successful 2013/14 season, reaching second place, imploded after the winter break and Leverkusen had dropped from second to fourth with five games remaining. "It was a very difficult decision because Sami did a great job the past two years," Leverkusen's sporting director, Rudi Völler, said. "The dramatic developments in the past few weeks, however, gave us no real choice than to part ways. We want and must try everything to rescue this season." On 6 June 2014 Sami Hyypia was appointed as manager of Brighton & Hove Albion on a three-year contract. The Sussex club reached the Championship play-offs in 2013/14 but were beaten at the semi-final stage by Derby County. Hyypia resigned as Brighton manager three days before Christmas 2014 with the Sussex club occupying one of the three relegation places after having taken only 19 points from 22 matches in the Championship. He was appointed as coach of Swiss side FC Zurich in the summer of 2015, but was sacked with three games of a season remaining that would see them relegated from the top flight. Liverpool Echo match report on Liverpool - Tottenham on 25.05.2009. Michael Walker at Daily Mail on 23rd October 2009. Talk Sport looks back at the career of one of Liverpool's greatest defenders, Sami Hyypia, who recently announced his retirement. From 3rd of May 2011. An article from a Finnish website on 21st of January 2007. Interview by Chris Bascombe in Liverpool Echo on 28th July 2000. Carragher shows his appreciation of the Finnish rock beside him in centre of defence. Claims Leverkusen boss Hyypia as he prepares to face old rivals United. By IAN LADYMAN at the Guardian on 15 September 2013. "When I played in Holland for Willem II nobody knew me as I played in quite a small team. Since I joined Liverpool everybody in Holland is interested in me." "The chance to go into the Champions League with the team I supported as a boy would be fantastic. If anybody had told me three years ago that I would be playing for Liverpool and we would be third in the Premiership I would have just laughed at them and said they were crazy. The boss was very brave for bringing in so many new faces all at once last summer. He is a good manager with a very good eye for players. He has a great knowledge of footballers all over Europe. That is why he was not scared to sign so many like me - players who no-one had ever heard of." "I have no doubt Sami is one of the world's best defenders. He is the perfect captain, takes responsibility and gives everything for the team. When we go into the huddle and have our brief pep-talk, Sami is always boss. Everybody respects him because we know he always gives 100 per cent. If something needs done, Sami is the one we talk to because he goes and does it. I like that about him. I have already learned a lot from him since I joined the club. If I've made a mistake in a match I ask Sami what I should have done and he gives me advice. He is a guy who holds everyone together when we need him most in hard games and tough atmospheres." "Of course I am not happy about it. But I feel relief now that I can get used to the idea that I am not captain anymore. I don't feel myself as a worse player because I don't have the armband anymore. There was nothing dramatic over changing the captaincy. I didn't say anything because it was the manager's decision and I respect that. I believe that captaincy will bring Gerrard to a new level. He's a young and talented English player, who has a great future ahead of him. I am not happy about our start to the season. We have to play better and we will do that. If the change of captaincy helps, then it's a good decision." "Obviously I spoke to Sami and his response was typically first class. He respects the decision and there was no bitterness or resentment. I know Sami will recognise this is a decision I've taken for the team. I have thought long and hard about this. This is not something which should be seen as against Sami. He has been a good captain for us and lifted six trophies. This decision will help Sami. I think he was ready to take on too much responsibility at times." "I’ve enjoyed giving our big defender plenty of grief since I scored against Finland in a World Cup qualifier. He was once spotted on a dance floor but reports say he was not exactly the most graceful thing on two legs, allegedly. Hasn’t been allowed to forget it." I want to stay at Liverpool, there is no doubt about that. We will see what happens. There have been no talks yet but I have a year left on my contract and I am doing my best. In football, you are on the bench sometimes and then when you play you have to try and show people what you can do. Of course, for me this is the first time in my whole career that I have experienced sitting on the bench. Every player likes to play, but I can understand the decisions. He is the manager and when he puts me in the team I will always try and do my best. I consider myself a good professional and will do a job when needed." "I actually saw our first goal in the dressing room while I was having treatment, so that was pretty strange. I was on the treatment table and I saw the goal on the TV and heard the roar." "I played alongside two of the greatest centre-backs of all time – Phil Thompson and Mark Lawrenson, Gary Gillespie wasn’t far behind them, he was unlucky with injuries – and Hyypia would fall into that category. I would’ve no problem playing alongside Hyypia. If we played in partnership we’d play off one another and I think he’d be very easy to play alongside. He’s a real quality player." "Everyone talks about foreign players like Zola, Henry and Bergkamp but they never look at Sami. In terms of consistency he's well up there with them, there's no doubt about it. Maybe he can do something out of the blue every now and again but every week, for nine months of the season, Sami Hyypia is your man. He's definitely one of the best foreign players this country has ever seen." The sale of Arbeloa, Hyypia and Alonso was an important loss. Alvaro was a player who did a vital job for us, always played to a high level and his flexibility was a huge bonus. Sami may not have played every week but he was a 10 out of 10 on and off the pitch, bringing calm to the ground and having everyone's admiration. And Xabi … players like Xabi are very rare. He was the team's engine and you know that when you change an engine, it takes time to work again. I'm a bit disappointed that my attempts to bring Sami Hyypia back failed. It only failed because he's so important to Bayer Leverkusen. We couldn't get him out of his contract. He's one I would also put in the Jamie Carragher-Steven Gerrard mould, Liverpool for life. Unfortunately he was let go at the end of the season before last and we can't get him back. He's too valuable to them. "Sami [Hyypia] came to us asking if there would be any chance to return to Liverpool. We had an open discussion. Sami accepted straight away that we were desperate to keep him here. He is too important for us and a valuable part of our first-team squad. We could easily imagine keeping Sami at our club for more than the remaining year of his contract. He may add another season on the pitch and we are also considering adding him to our backroom staff afterwards, if he wants."